With all the press that Amazon got about it’s innovative idea of delivery drones, it only makes sense that another company would dare to take an ambitious step in the same direction. 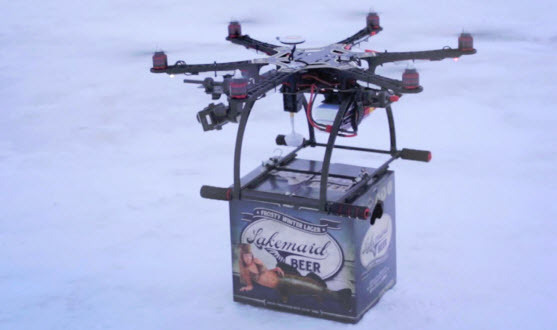 Unfortunately for interested buyers, the FAA has outlawed the use of drones to deliver beer to ice fisherman in Minnesota. While it seems like drones have become part of the technical day to day conversation, commercial use of drones are still on the outskirts of legality. Lakemaid Beer in Minnesota, sadly, realized that their pursuit of the perfect beer delivery system won’t yet come to fruition. The company released a Youtube video showing their strategy for delivering beer to those who brave the cold Minnesota weather to ice fish. However, after this video posted, the FAA was quick to squash the venture, apparently blacklisting Jack Supple, president of Lakemaid. This seems to just be another step in the quest for drone delivery systems. As it isn’t legal yet, the FAA is still working to establish a set of rules and guidelines to change that. Even with Supple’s attempts to side step the rules, one of which was to not actually charge for the beer, there was still 74 pages of violated code, according to Supple. Though there is still some more work to be done regarding weight and maneuverability, it seems like once the FAA clears up their issues with drones, Lakemaid may be able to jump right into the delivery market.